Andreas White, one of our artists, sits for a 10 hour head tattoo. Check out our in-shop merchandise! 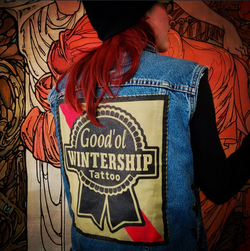 Stop in and pick up a shirt, hat, pin, patch, jacket and more with original art by our artists.